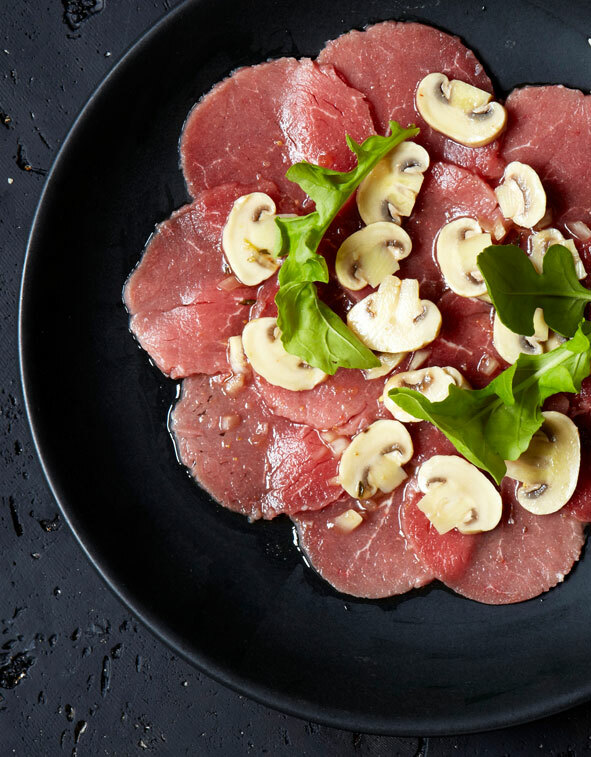 This carpaccio with marinated mushrooms is a stunning starter for a special occasion, with delicious Pronto Mama Marinated Mushrooms with Chilli and Thyme. Brown the fillet very quickly in a very hot pan and season well with salt and pepper. Roll the fillet in cling wrap until it is perfectly round, then place it in the freezer until it is completely frozen. Remove the fillet from the freezer and using a sharp knife slice it very thinly, placing it directly onto a serving plate as it becomes difficult to handle when it has defrosted. Top the Carpaccio with the sliced mushrooms of your choice, and season the whole thing with salt and pepper. Drizzle over a little olive oil and garnish with micro rocket just before serving.